This Patient lost his leg in 1983 in Cambodia fighting against the Khmer Rouge. 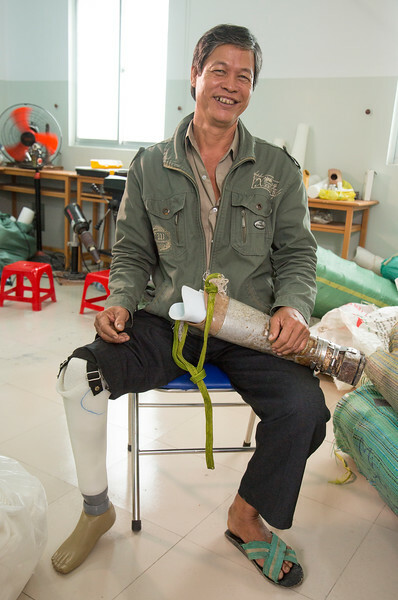 When he returned to Vietnam he was fitted with a prosthetic but it did not withstand his work in the rice fields, so he had to adapt it for the wet and muddy conditions. When a group of volunteers visited the buddhist temple he attends last year, he was told how to get fitted for a new prosthetic at the Mercer Clinic. -it weighed 10 kilos? pounds? Q4 Now that you have a lighter prosthetic, what will life be like now? Q6 How did he find out about Mercer prosthetics?